The SPT-50 was designed for use in heavy industrial washing operations as a pre-treatment system to remove free oils, grease and high TSS from the waste stream. 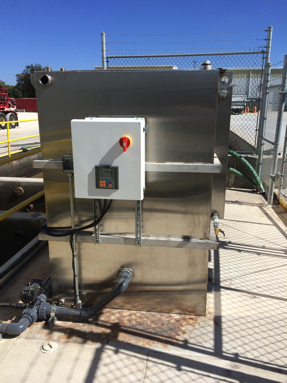 SPT-50 Clarifier Oil Water Separator System – The SPT-50 was designed for use in heavy industrial washing operations as a pre-treatment system to remove free oils, grease and high TSS from the waste stream. It is a two-part system designed to be simple to operate but very effective in its ability to remove oil and solids from the waste stream. The first clarifier section will trap and remove coarse amounts of oil from the waste stream and remove as much Total Suspended Solids (TSS) as possible. The plates will also capture larger bubbles of oil and liberate them from the waste stream before they get to the secondary oil water separator section. In that section, coalescing media will remove essentially all free and dispersed non-emulsified oils to an effluent concentration of less than 5 ppm. The entire system can be easily cleaned and maintained. Sludge hopper to capture and contain settleable solids. At Wash Bay Solutions, our emphasis is on quality. These systems are exceptionally well-engineered and designed for heavy-duty commercial and industrial operations. Simple to operate and maintain, they will run for years in the harshest environments. 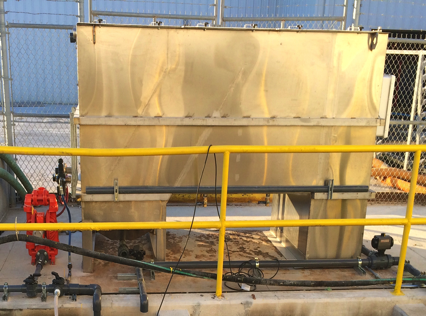 This equipment has been re-furbished following less than a year’s use at an industrial washing facility. It is priced to sell or available for lease. Call us at 800-453-8639 for pricing information.